So here's the first episode of the CinemaSpection podcast. 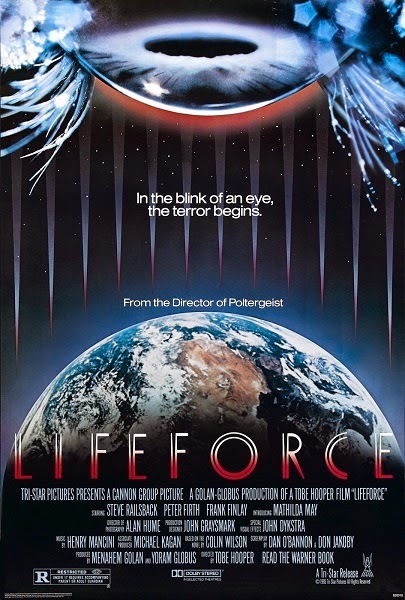 To kick things off, Tim and Ellie ponder the 1985 sci-fi / horror cult classic Lifeforce. Space vampires, phallic objects, and trenchcoat / turtleneck fashion critiques abound. Warning: contains explicit language, spoilers, and Steve Railsback overacting. Subscribe to our podcast on itunes here. It's been far, far too long since I've seen Lifeforce. Not since high school. There's much I remember enjoying about it (not just the obvious), and I was always amused at how it loosely echoed the structure of Plan 9 from Outer Space (Act 1: alien movie, Act 2: vampire movie, Act 3: zombie movie). And yes, absolutely Queen of Blood! Been holding off on a fresh watch till I finally get around to the novel, which has also been sitting on my shelf for far, far too long. Sadly, one of the few Dan O'Bannon screenplays I've never managed to track down. Allegedly, Hooper altered quite a bit, and given how wildly different Dan's draft of Invaders from Mars is to the finished film, I can believe it. I hadn't really considered the Plan 9 connection. Whatever his shortcomings as a filmmaker, Wood was ahead of the curve when it came to the appeal of zombies and merging sci-fi with Gothic horror. I'd be curious to see if O'Bannon's screenplay was closer to the novel, and now you have me interested in tracking down that Invaders From Mars script. That's another movie I ought to revisit soon. I remember enjoying it a lot as a kid (perhaps because I could convince myself I was really watching a "scary" movie at an age when practically everything traumatized me) but seeing a lot of flaws in it as I got older. I wonder if I'd find it more charming now.